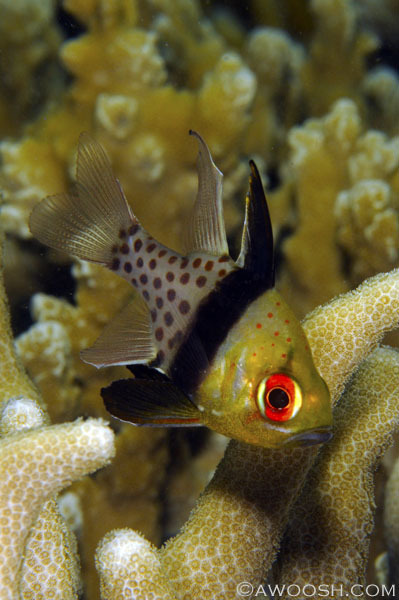 Friday’s funny fish face is the Pajama Cardinalfish (Sphaeramia nematoptera). I photographed this little cutie on a shore dive in Fiji earlier this year. It is kind of an amusing tale – the visibility was pretty poor (downright spunky in fact) and I was diving with a couple of the guides at Wananavu, who were being really kind in helping me find cool stuff to photograph. I believe that their primary purpose was really to check me out (it was my first dive of the trip) so that the managers of the dive op could feel confident that I would be okay diving solo on future shore dives, as I had indicated I’d like the opportunity to do that. As an aside, solo shallow dives are magic to me – a chance to do a super long dive (sometimes 2+ hours), mellowed out, looking for neat stuff, with no fear of getting lost ie not being able to find the boat, no buddy to get bored or cold, and no time constraints other than the amount of air in my tank. I’ve done some sweet ones over the years. I should add that I had a lot of dives, in all sorts of challenging conditions, before I ever attempted a solo dive. I also carry a redundant air source (a slung pony bottle) when I dive solo, and I keep the dive pretty shallow. Really, it was the perfect location for this at Wananavu – no current at all, lots of great stuff in the shallows, and easy entry and exit via a stairway to heaven. I was following Kini, one of the Fijian dive guides, when I first saw a few of these reclusive little fish (about 2.5 inches long), hunkered down in a branching coral. I was super excited, as I had not seen these little beauties before. With the viz being poor, I did not want to stop and try to photograph the fish, for fear of losing Kini in the murk and freaking him out if he turned around and I wasn’t there. So I made a mental note of the depth and the shape of the coral features, and I promised myself I would come back later in the dive. A couple of days later, having been given the nod to solo shore dive, I went back in. I dropped down to the prescribed depth and moved along it until I found the branching coral with the Cardinalfish. Man, these fish are frustrating to photograph! They like to lurk down deep in the branches of the coral, making a clear shot difficult. In addition, I was shooting my 105 mm macro lens (in manual focus), and between that and the spunky viz, I had to really get up on the fish to get a decent shot. Finally, after several minutes of working it, I got this image, and moved on, feeling really pleased and excited to have finally seen and photographed this adorable fish. Now here’s the funny part ;^) On this totally mellow, super long dive, I just kept venturing down the reef, far past where I had gone with the guides. And the further I went, the better it got – the viz improved, and I found myself in some really gorgeous coral gardens with oodles of fish – clearly a nursery for many varieties of tropicals. And amongst those oodles of fish, there were reams and reams of these Pajama Cardinalfish. They were freaking everywhere! This entry was posted in Fiji Travel, Photography, Pic of the Day and tagged Dive Wananavu, Pajama Cardinalfish, Sphaeramia nematoptera. Bookmark the permalink. Hi, you write about your dives in such a beautiful way. This reader just took a virtual dive with you and I am scared to death of water over four feet deep! You describe a world that is so foreign and so mysterious in a way that makes me want to read about it more and more. Notice, I didn’t say I wanted to go there! Thank you for sharing your fabulous pictures and stories of “your” underwater paradise. Thanks for the kind words Martha! It has always been my intention to try to share the wonder of the undersea world, especially with people who may never go there.